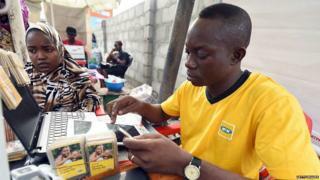 Nigeria goment don fine mobile phone operator MTN Group wit $2 billion tax bill. Dis na di latest palava wey don fall on di South Africa company head follow di Nigeria Central Bank (CBN) order on 30 August for di mobile phone operator to return over $8 billion. CBN dey claim say di company use mago mago cari go di moni go obodo oyibo and dem also fine four Nigerian banks wey get hand for di mata. MTN wey get dia Nigeria headquarters for Lagos confam say dem don do meeting wit Nigeria Attorney General Abubakar Malami unto investigation on top dis tax mata wey di Group dey face. ''Di Attorney General office do big-level calculation and from wetin dey see, dem believe say MTN Nigeria suppose pay $2 billion for tax unto di import of foreign equipment and moni we suppose pay foreign suppliers over di last ten years'' na so MTN tok. MTN Group tok say, ''Based on our own torchlight of dis mata wey we do, MTN Nigeria believe say we don settle all di moni wey owe unto dis tax mata''. MTN still tok say dem settle $700 million of tax moni wey dem believe dem owe. Shares for MTN fall by around 7.5 percent wey be di lowest wey e don happun on almost 10 years. MTN don face plenti wahala for di last 17 years sice dem begin operate for Nigeria. MTN na di biggest mobile phone company for Nigeria, dia customers reach around 50 million pipo.